David runs away, teasing Edna with her toy. I hold Edna, asking her “Where is he? Where did he go?” She is a nimble little thing, and I have to be careful or she pops straight up in the air to escape. I run with Edna, (holding my pack so it doesn’t slap me to death!) and David plays with her as soon as she arrives. She likes to tug for awhile, and also to retrieve the thrown disc. The reward! Fun, fun and more fun. Volunteer’s-eye-view of training a search dog! Now that Edna has a couple of weeks’ worth of puppy runaways behind her, I plan, next week, to teach her the complete, very important runaway/refind package: the recall to me and her “alert” signal, which is a bark — which I taught her to give on command, a few months ago. 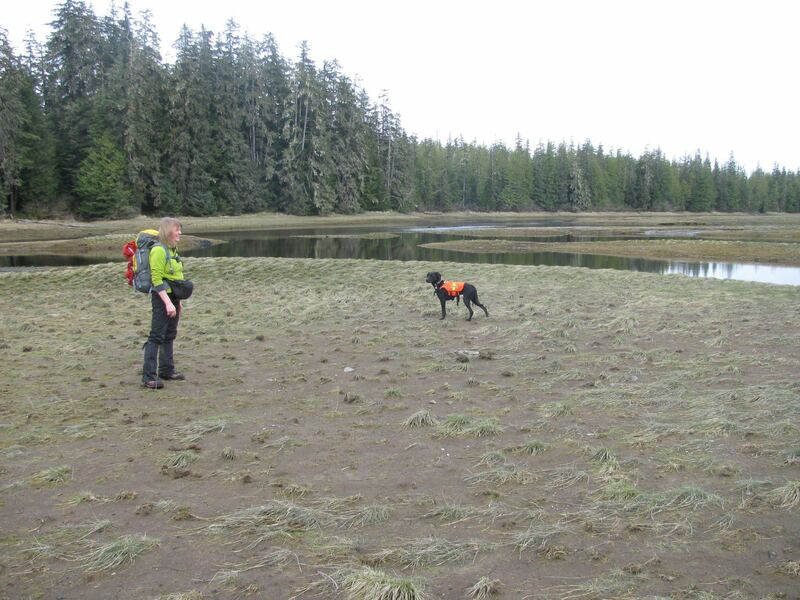 The runaway/refind is the most critical part of the wilderness airscent search dog’s training. Pretty much any pet dog can find a human via scent. 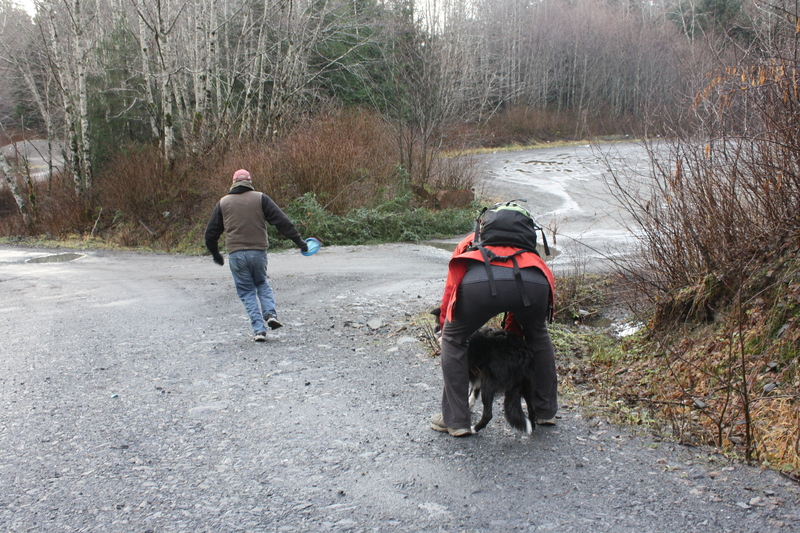 A certified SAR dog must, in any situation, under any duress, return and “tell” the handler it has just found a person. 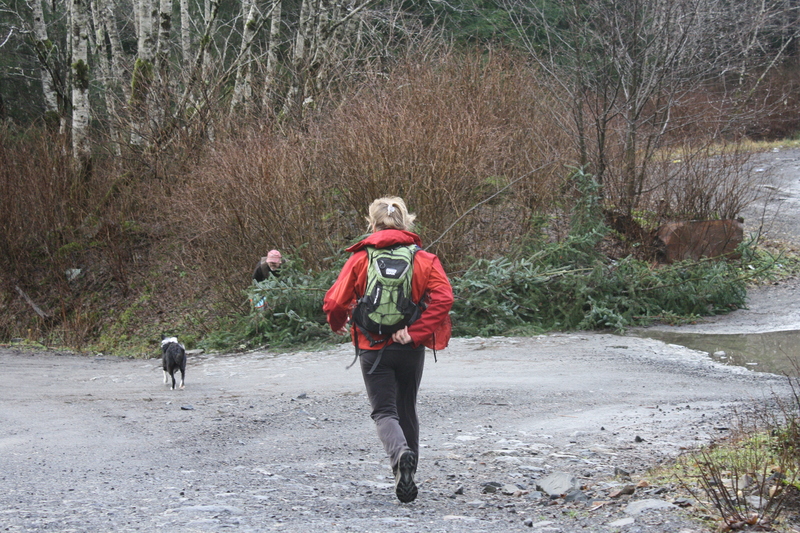 This often is challenging for several reasons: rough terrain can be tough to power through; also, when the dog is tired after several hours of searching, it can be difficult to remember a trained behavior sequence; and, often the dog must find its handler by scent, because the lost person they just found is out of sight of the handler, and on the downwind side – the “wrong” side. 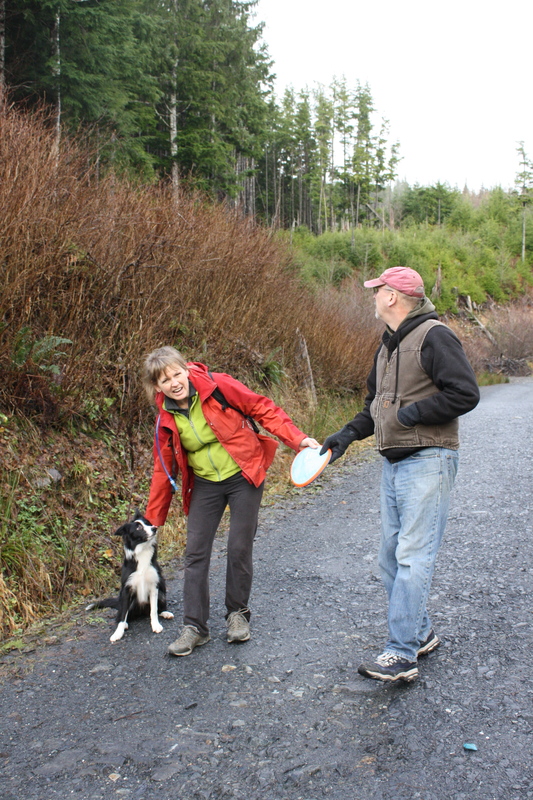 After “telling” the handler with some sort of signal — a jump, a bark or a sit, for example — the dog must remember how to return to the lost person and lead the handler in, no matter how many times it takes to run back and forth between the two people. We practice the runaway/refind sequence in every search training session to keep it strong, to assess any weaknesses, and also – because the dogs LOVE them, and it’s part of a great reward system. So, Edna turns 7 months old on New Year’s Eve. She is a spritely little thing at only 30 pounds. I had made that my target age to ramp up Edna’s search training. I almost regretted that, because I spent quite a bit of her early months worrying about how she would perform when we finally started our real search training. At first, she did seem slightly tentative while playing with the people who helped me with her first runaways. In a runaway, a person takes the her toy and teases her with it while I hold her back and encourage her. They are not scenting problems. They are set up to simply teach a dog that a person is out in the woods and has their toy, and running to them is the most exciting thing of all! In the very first runaways, the dog is let go to run after the volunteer as soon as he/she tucks behind a tree or other object. As soon as the dog arrives at the “hidden” person, the volunteer plays with the dog — it is a big party. 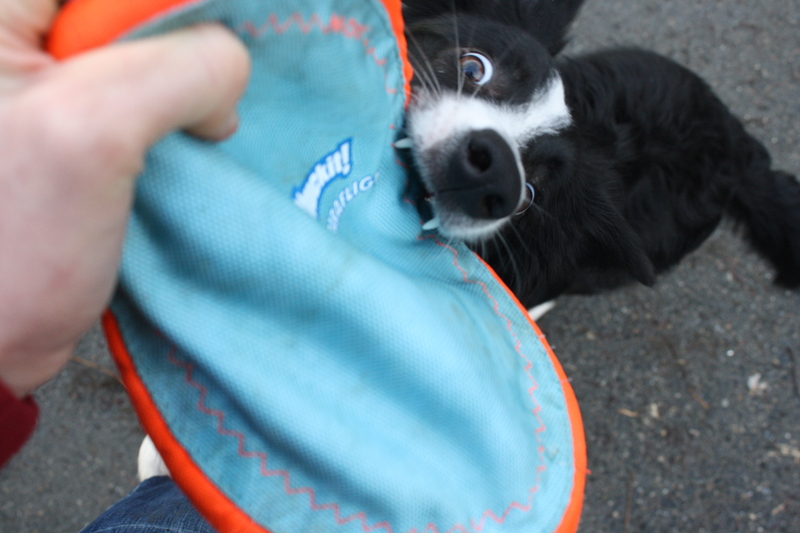 The best search dogs are highly focused on the toy, so are easy to motivate. At first, as is usual, I played “lost person” and Edna did great – lots of enthusiasm and focus. When I began to set up problems with strangers, however, she was a bit less confident. She played with less intensity, and seemed just a bit less eager. I have to admit, I was a bit worried. If Edna didn’t have what it took to be a great SAR dog, I’d be faced with unthinkable choices: re-home her or give up search and rescue for the years it would take Levi to pass away so we’d have room in our home for another large-ish, very active dog. It is a tough and scary reality for any SAR handler. As we have practiced more, however, I saw that my first suspicion — that she simply needed more experience playing with new people in this strange new game — seems correct. Her runaways with family members or teammates are great. As a young puppy, she was very submissive with new people, and it took her months to grow out of her habit of greeting people with submissive urination. She is a sensitive and respectful girl. So, I am working to build confidence in her that will make her able to careen into any person at all and to grab that toy and tug the heck out of it. By February, I plan for her to be ready for actual searching — where she does not know where the person is, and she uses her nose to find airborne scent. Now she has some great intensity when I take her out for training, and I get her started with the word “ready!” I am working on enhancing her awareness of how to maneuver her feet. Dogs are generally quite unaware of the position of their rear feet, specifically. To train a dog for precision heeling one sees in competitions such as AKC or Schutzhund trials, you must have a dog that has not only complete mental focus on the handler, but awareness of where its feet are. It almost is like you are training a dance partner. Edna, midway through this program, can now walk backward on cue, and is learning to step up on elevated objects with her rear feet. It has been challenging, as she is very aware and sensitive, and wanted to dodge any object, such as a plank or low bench, or even a snow sled, that I place for her to practice on. Another obedience challenge I am tackling is her come when called under distraction. Like most dogs, as she gains confidence as an adolescent, she is less likely to obey my call to come when she sees people and their dogs approach. I am now putting the electronic collar on her (uncharged) when we go for walks so she associates it with fun outings. I will use it as an invisible leash to correct her when she refuses to come when called in exciting situations. We continue to do fun training tasks as well, such as “shake,” and “crawl” (a low army crawl,) down stay, sit stay, “bark,” and other necessary and less “fun” commands as well such as “leave it” (i.e. put that deer leg down NOW) “let’s go,” (time to get in the car!) and other every-day things. It’s time for an Edna update! 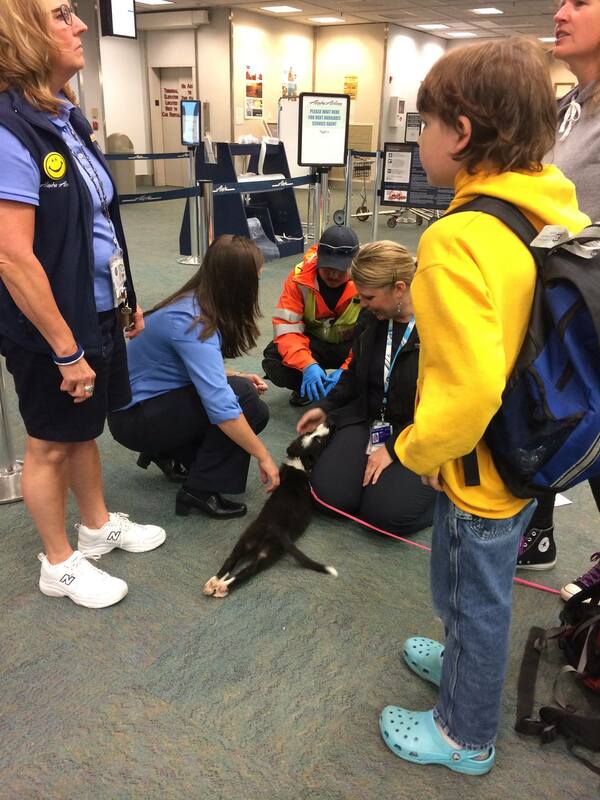 Edna effortlessly charms the Alaska Airlines staff at Ketchikan airport. She has been busy, these two months she has been a Landis household member. After three weeks living here, it was time for family vacation. She traveled with us to Blanchard, Washington which is near my family and at the border near northern Idaho. We had a layover at SeaTac airport long enough that my daughter, Claire and I picked her up at the Alaska Air counter and took her out for a little break near the miserable “dog area” outside the terminal. We found some shade near a strip of shrubs above the area, and even better, an adorable 8-week old boxer puppy that was on its way to Anchorage with a friend of her new mom’s. Edna was unimpressed with the puppy. I have found, since, that she will bare her teeth at puppies after the first 30 seconds or so of greeting, and even at some adult dogs she meets. That is something I am working on. We lived for two weeks in our vacation rental and Edna really was delighted with the resident ranch dogs, German shepherd Ivan and Boston terrier mix, Cruiser. She also really liked Luke, my brother’s young Doberman pinscher, which he just adopted last spring. Edna and Ivan in the front yard of our vacation rental. Edna and Luke chill near the pool while we play in the sunshine. Most of our training has not been too fancy. My strongest priority has been to finish up potty training! That is my least favorite task with a new dog. Once she hit 16 weeks, it seemed like she began to be capable of more awareness and focus and began to go to the door when she needed to go out. I am using clicker training for many tasks, but not all. The worst thing about using a clicker is that I often don’t have it with me when I need it! We also are practicing loose-leash walking. One of her more annoying traits is that she submissively pees when meeting new people. I have noticed that in the last week this is lessening, which is great. I’ve just ignored it, feeling pretty sure it would fade as she gained maturity and confidence. Even more annoying is that she loves to exuberantly greet our two cats while peeing and swishing her tail through the puddles. Oh, the joys of a puppy! 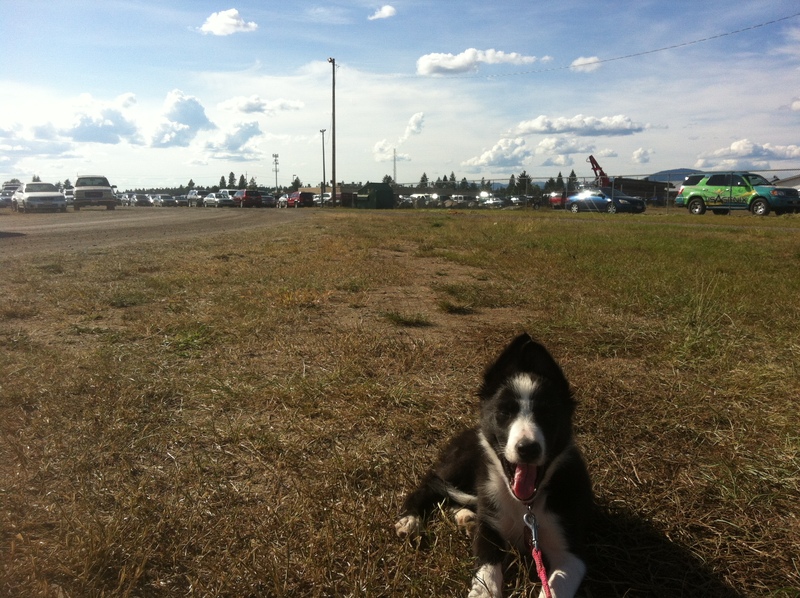 Edna at the Kootenai County fair in northern Idaho. Edna on September 26, with her newest ear style. She has had both down, one up, both up, and now both sideways – “rose ear” style. Since returning home, Edna has been meeting many new people, puppies, dogs and training a little bit every day. I have introduced her to many different types of toys, so I can decide which type will motivate her the most when we begin search problems. We take at least a one-hour hike each day, and I am focused on getting to know her so I can be the best handler for her when we are ready to hit the woods for some real work! 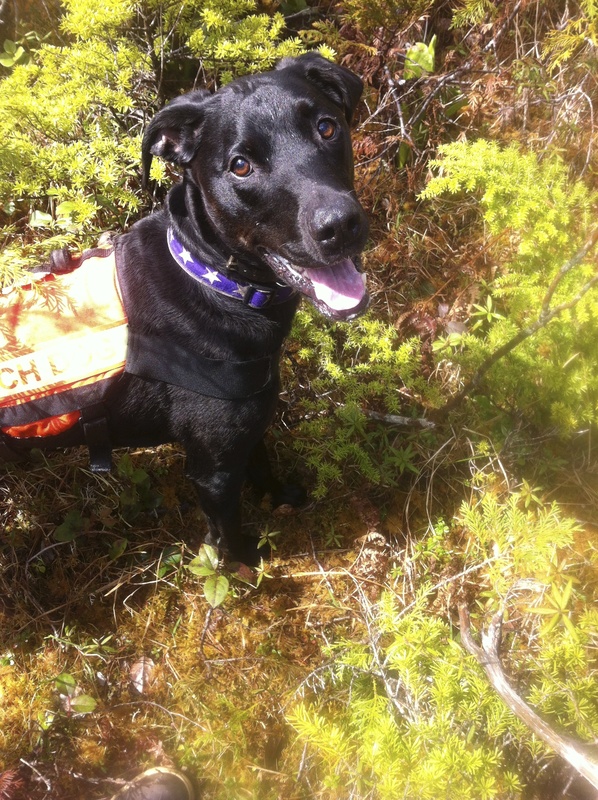 General Training Tips, Leadership through feeding, Puppy training, Retraining a Rescued Dog, Search and Rescue dogs, Teaching your dog to "Come"
Edna after a fun walk of exploring a muskeg. Edna is growing quickly, and learning fast. An important thing to remember when raising a puppy, or training a new dog, is that they are learning every minute. It is up to you to control their experience, so pup learns what you want her to learn. If you cannot control pup’s actions, (i.e. you are in the shower, or engrossed in a cooking project,) put pup in her crate for a rest, or to chew a stuffed Kong toy or other tough, safe treat. success will take hundreds of repetitions. Make sure you have treats in your pocket all the time, to reward good behaviors such as sit, down, potty outside, come when called, off (four paws on the floor), and anything else you like. Edna exploring the beach while camping. Edna is getting very good at learning to sit and wait for her food. I leash her after I have all five bowls filled. When I set all the bowls down, the leash keeps her in her spot. When the bowls are down I ask her to sit. She (and the four other dogs) are not given the “ok” command to eat until Edna is in a good sit — don’t get in a hurry on this one! This means sitting with a LOOSE leash. This is a great exercise to teach self control. 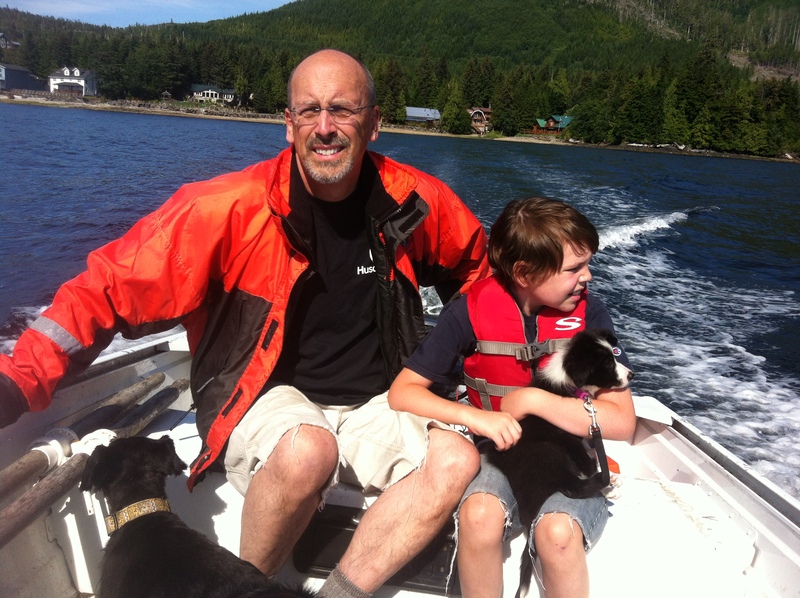 My husband, David pilots the skiff to the beach while my 9-year-old son, Izaak holds Edna on her first of many, many boat rides. Another critical exercise to work on with a puppy or any new dog is food safety. Do not take the bowl away while they are eating at this stage, it only makes them defensive and less safe with their food. I save leftover meat bits and while Edna is eating, I stroke her body, touch her paws and put the meat bits in her bowl. That way, the dog learns that a hand coming toward them always is positive and they never should worry, growl or bite. I also ask kids to do this, as dogs often do not think of kids as worth respecting. We continue to work on “come” although she runs to me immediately and at top speed right now. All pups, as they grow older, will become more distracted by the outside world (like any teenager!) and can lose that 100% great come when called if you are not careful to continue strengthening it with high-value treats, and practicing in all types of places, with all types of distractions, and following through to make pup come when it decides to disobey and wander off. 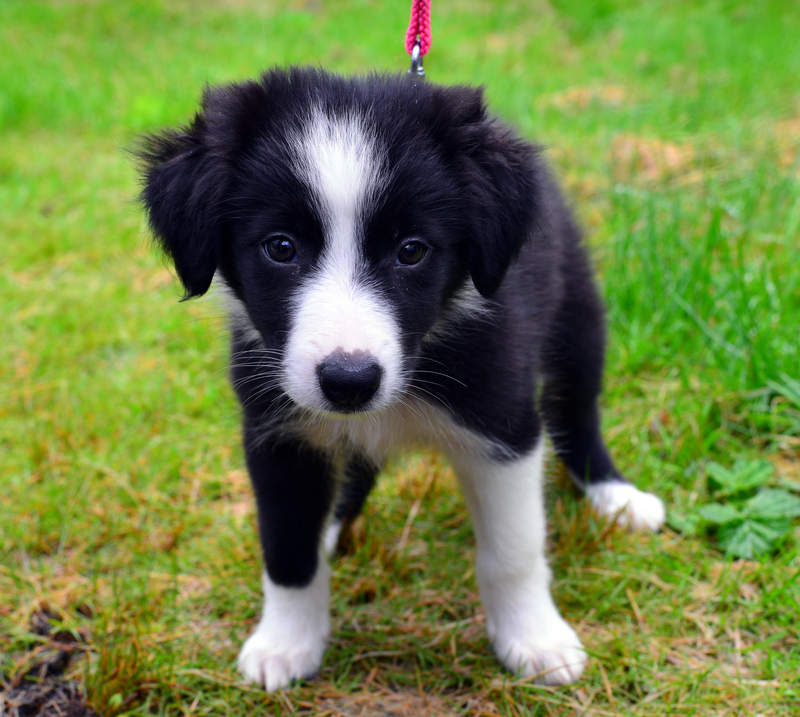 If the wandering off or running away happens, put a long, light leash on pup and try again, using the leash to guide the behavior. I had a couple of episodes this week where Edna, coming out of our fenced yard with me after a potty to our deck-side door about two feet away, would get distracted by a cat or a bird or … nothing (she’s a puppy, after all!) and wander away instead of following me straight through the door. I have been solving that by using a treat (actually, just a piece of her kibble – mostly I use her kibble for treats right now, to keep her tummy happy.) The way I give the treat in this instance is to lure her through the door while saying “let’s go” to encourage a habit of moving fast to the door, all the way indoors. Then, I drop the treat on the floor inside. I also brought her out to our garden, dragging a light leash just in case I needed to control her, and she had fun walking around in our raspberry thicket, stealing berries that had fallen and biting weeds. 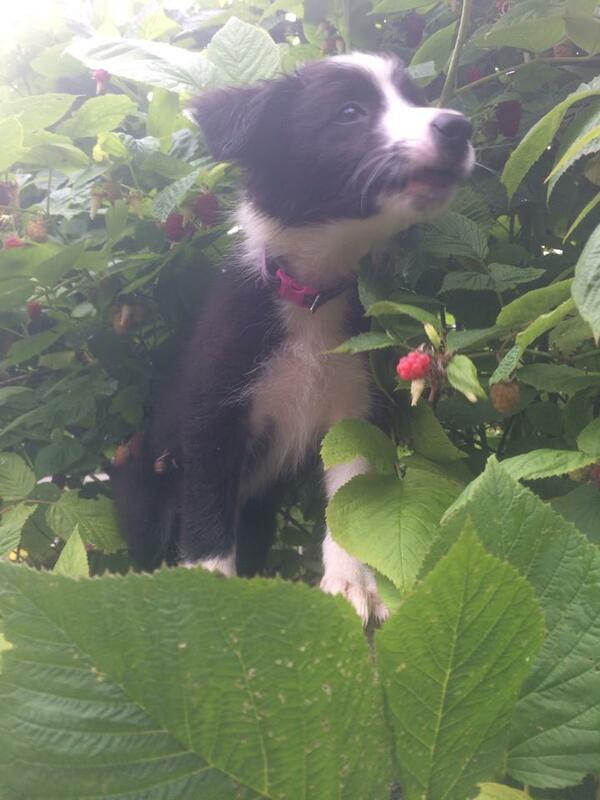 Edna helping with raspberry harvest. I have been shaping some obedience trial behaviors, just in case I decide to compete with her later. A straight front sit, a fold-back drop down, a “get back” to heel position, eye contact and even a heel with head up (only one step at a time for now) are mostly what we play with for now. The only Search and Rescue type things she’s done is explore creeks, ponds, muskegs (where she fell in many watery mud holes!) – obedience and socializing so she’s comfortable with all people, noises, floor surfaces etc. I also introduced her to carefully chosen new dogs. She also had her first skiff rides this week, when we took her for a two-day camping trip to a nearby remote beach. She slept in her crate in the tent very quietly, and explored with great happiness. She loved the seaweed. housebreaking. I have either my eyes on her, or she is locked in her crate. She gets a treat and hears the command “potty” when she goes outside. This is time consuming – when awake and playing, a pup has to relieve itself every 10 – 15 minutes! clicker training. I am “charging” the clicker with her. All this means is that a primary reinforcer (food) is given at the same time a secondary reinforcer (could be anything — sea mammal trainers use a whistle, dog trainers like a little device that makes a distinct “click-clack” sound. This helps when training very precise behaviors later. I hope to not only teach her some fun tricks, but also to train her to alert on cadaver material, items people may have discarded while hiking, (and maybe my GPS when I lose it in the woods one day!) and also it helps when training a bark on command, which I plan to teach her so she can tell me when she has found a lost person. socialization. Edna is very social and sweet, but meeting all kinds of people in all kinds of environments will boost that great temperament and preserve it. She went with me to the Ketchikan Daily News, where I used to work as a reporter (and am filling in now, part time,) and she was held by men, women and she trotted around and had her photo taken by reporter Nick Bowman. Edna on her second day home, getting ready to visit Ketchikan Daily News friends. small, important lessons. She has taken two gentle, small hikes with me and our four other dogs. 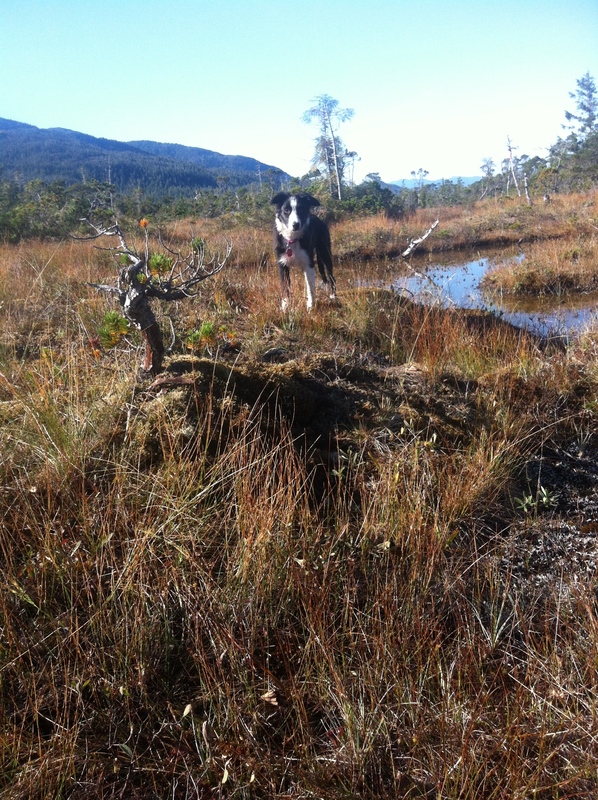 She has experienced woods, trails, wet, thick brush and lots of puddles already. She is very brave about the rain, puddles and cool temperatures. Teaching her to accept a collar and to give into leash pressure is another project. When it’s sunny, I tie the dogs up on our broad deck – they love to lie in the sun while I weed the garden and pick raspberries. Today was Edna’s first time, and it took her awhile to accept the limits of her tie out. She had a nice chew bone she finally gave into, and she accepted the fact that she would just have to wait patiently. She also is learning to follow me, to respond to her name (I just give her a bit of kibble while saying her name.) She also is learning that she must not use her teeth on people in play. We use a gentle correction of some sort – either a finger tap on the ribs or lifting her away via scruff, then we redirect her by wiggling a toy so she can bite that instead, and praising her. “Come.” The most important lesson, possibly. Many times during the day I give her a treat while saying “Edna, come!” This works to train older dogs too – even ones who have learned bad habits. I turn a bit to the side, crouch down, don’t stare at her face, and hold the treat against my leg to encourage her to push in close. Sit for a meal. This is pretty simple – using a leash to control her movement. All four older dogs know to sit for their food, so I use a leash to keep her from lunging into their bowls, and to guide her into a sit. Being a Border Collie, she very easily and naturally folds into both sit and down positions. This is where I am teaching her the release command “OK!” When she is in a stable sit, I say OK, all the dogs start eating, and I encourage her to stand up and dig in. The “OK” will be used a lot when releasing her from sit or down stay, or from a crate. Kennel. Go into a crate on command and quietly stay there until released. She whines a bit about the kennel in the car, but it is mild and I am confident she will stop when she realizes it accomplishes nothing. She slept quietly from 11 p.m. until 6 p.m. this morning, so I was happy about that! “Off.” When she tries to jump up on the couch, we gently guide her back down and say “off!” the minute her feet hit the floor, then give her praise and the attention she was seeking. This one is tough with soft-hearted visitors/kids and an adorable puppy! “Leave it.” Good for biting houseplants, toes, poking cats and other puppy misadventures. We use the same routine as for putting her teeth on people. “Wait.” Great for warning to not go through a door, or to run off when I’ve dropped a leash, or to keep a dog from jumping out of the car when you realize another car is coming, or you are having a hard time untangling five leashes. 🙂 I just block the dog with my hand or the leash when they first are learning, saying “wait” as I do it. So many things to teach a young puppy! It is very fun, and rewarding, and if the foundation is set up correctly, the pup will be a delight as it grows, rather than a large, hyper, gangly menace. Here is Levi illustrating a finished runaway/refind, where we practice finding a person, running back to tell the handler with an “alert,” which in his case is a bark, then leading the handler in to the “lost” subject. It takes hundreds of repetitions to become proficient at bulletproof runaway/refinds that will hold up in the field in the face of distraction, exhaustion and complex scent pictures. 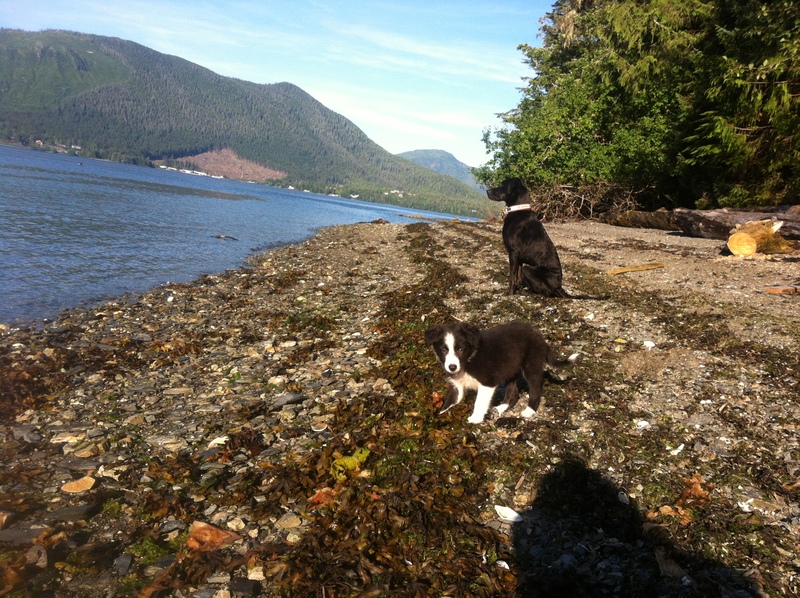 The Ketchikan Volunteer Rescue Squad K9 team needs volunteers interested in training search and rescue dogs. The team started in 1996 with more than 20 members. Through the first five years, the numbers shifted and dropped as people moved, got too busy, or realized they or their dogs weren’t cut out for search work. In the past several years, however, the team has settled to a small, but dedicated core who started with the team at the beginning. Now that some are nearing retirement, it’s time to recruit some new people and dogs! Who are good human candidates? People who love to be in the woods in all weather. 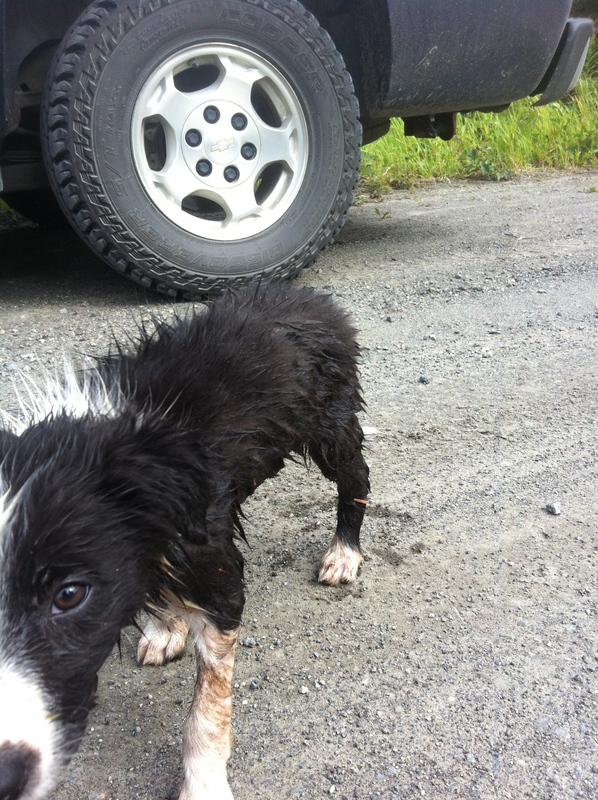 Dogs and people must search in the worst possible conditions, and they often are “worst” in Ketchikan. People who can train about three times weekly in the first few months of starting a dog. They often are short little problems, but must be frequent with a beginning dog. Sometimes the most difficult and frustrating part of these training sessions is finding willing volunteers to hide for and play with your dog. People who aren’t afraid of, or are willing to overcome a fear of bears and working in the woods at night. People who think it would be a fun challenge to learn navigating all alone in the wilderness, or who already have that skill. What kind of dogs will be good candidates? Under two years old. It takes about two years to certify a dog, so you really don’t want to go through all that work and time and have a finished trainee with only a few working years left. Doesn’t only enjoy the retrieve game but *will not stop. * This is critical. Without that, you have no search dog. Best dogs are between 40 and 70 pounds. Large dogs break down quickly, are slow in our steep, thickly-wooded terrain and are tough to fit into small aircraft and boats. First, you contact me, at 247-1719, the team captain; alternatively, contact KVRS at 225-9010. To be a dog team member, you also must be a KVRS member. You also can find KVRS on Facebook and at http://www.ketchikanrescue.org. As you train your dog, you will be part of the KVRS search efforts, and on-call as a searcher for callouts. You would get a call or text with a brief message describing where to meet and what type of search it is. Callouts can happen at any time of the day and night, but it’s more rare to get them in the middle of the night. 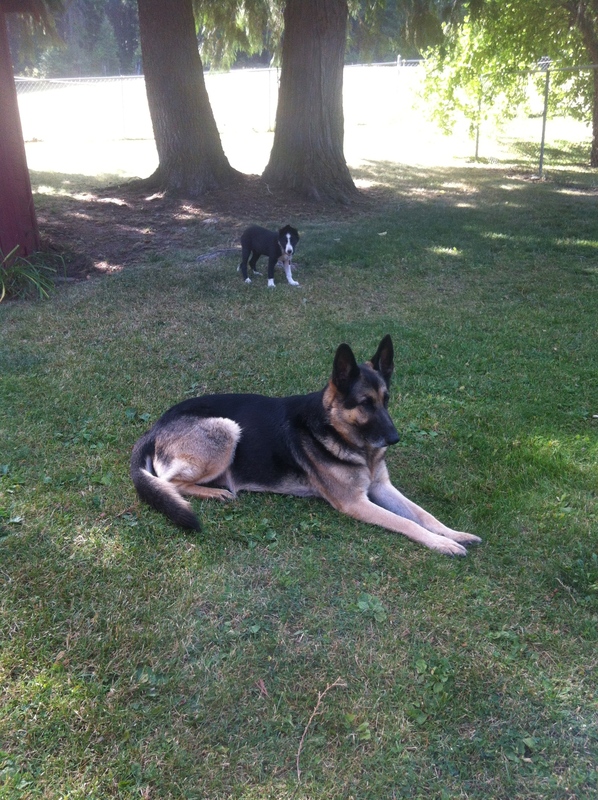 We would arrange a time for your first dog training practice — usually, we train on weekends. 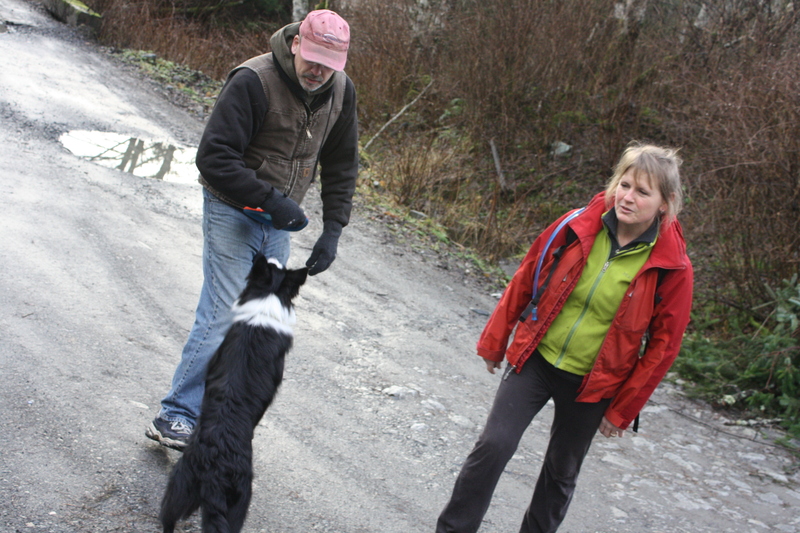 With a beginner dog, you’ll be wedging in practice time on weekdays as well. At your first practice, your dog would stay in your car, hopefully safely in a crate, while you both walk with us as a handler, then also hide for us as a subject. We take the new dogs out last so that after their first “find” they get a walk and playtime, not back-in-the-car time. Just finishing clearing one side of a long creek on a 2012 search for a lost flyfisherman. What do I and my dog have to do to be allowed to go on actual missions? A KVRS K9 dog/handler team must pass three tests: 1) successfully find a person in fewer than six hours in a 160-acre area, showing expert dog handling, navigation and field preparedness; 2) successfully find a person along a 1-mile trail in the dark, in less than one hour; and 3) pass an obedience test that includes heeling off-leash among people and dogs, a down stay with the handler out of sight, and entering water willingly. A team must be approved for testing by the rest of the team in a vote before the team is allowed to take a test. We love to meet, and hear from new people, so let us know if you’re interested in just coming to hide for us, walk with us, or to see if you are interested enough to start training a dog, or to try your own dog out.